Horizons can also be edited by right clicking on the horizon and using the context menu. Right-click a horizon displayed in a section view. This will open the context menu. Pick "horizon" — Click this to enable manual picking of a horizon. While in the manual picking mode, you can exit the picking mode by right-clicking the horizon and select Stop picking seeds for "horizon". Flatten on "horizon" — Click this to create a flattener process using this horizon (see Flattener). Add seed points to "horizon" — Click this to place more seed points to propagate the horizon. Erase from "horizon" — Click this to enable the manual eraser tool to erase part of the horizon (see Erasing a Horizon). Hide "horizon" — Click this to hide the horizon in the view. Notice that at the horizon panel header, the horizon has been disabled as indicated by the amber circle. Right-click a horizon displayed in a Map View to open the context menu. Settings for "horizon" — Click this to open the Horizon Settings. A single-horizon amplitude extraction can be performed here (see Horizon Display and Amplitude Extraction). Flatten on "horizon" — Click this to create a flattener process using this horizon (see Flattener). The domain in the Map View will automatically switch to the new flattened domain. Polygon eraser — Click this to erase part of the horizon inside/outside a drawn polygon area. 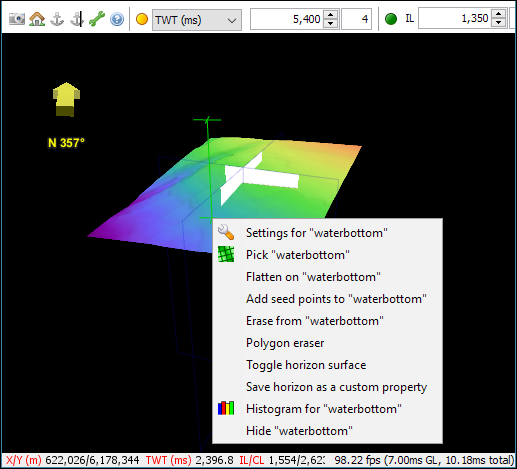 This context menu option is available in the Map View and 3D View (see Erasing a Horizon). Save horizon as a custom property — Click this to copy the horizon property of a horizon to another horizon. This context menu option is available in the Map View and 3D View. Type a name for the new property and click OK to begin copying. Histogram for "horizon" — Click this to create a histogram (see Displaying Horizon Histograms). 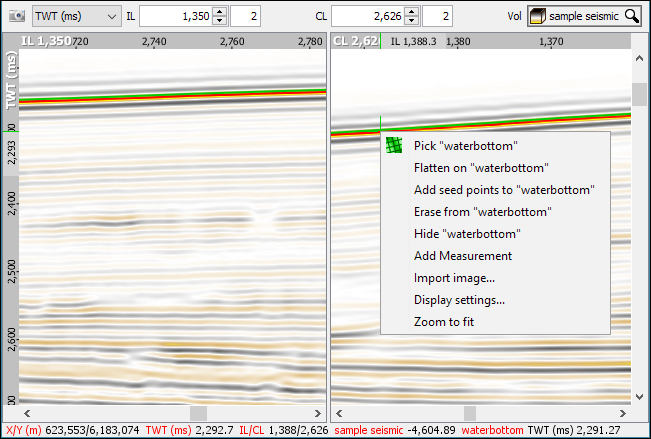 A histogram showing the TWT distribution of the horizon will be displayed. 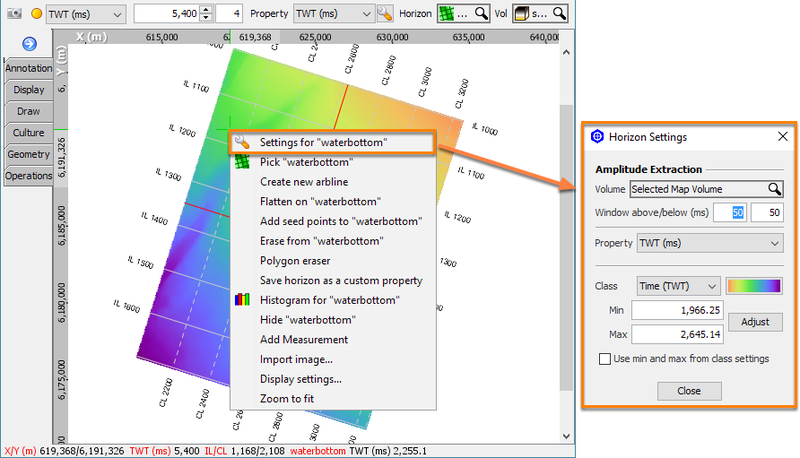 Right-click a horizon displayed in a 3D View to open the context menu. Flatten on "horizon" — Click this to create a flattener process using this horizon (see Flattener). The domain in the 3D View will automatically switch to the new flattened domain. Toggle horizon surface — Click this to switch the display of the horizon between the intersection mode and whole surface in the 3D View. This context menu option is available in the 3D View only.